Football and soccer. Sunshine. Wife and children. Teaching. These are the things that keep me from becoming eerily similar to Elizabeth Brown in The Library by Sarah Stewart. But Elizabeth Brown has books, and she continues to acquire more. When she goes to school and unloads her books, they collapse the upper bunk - under the disapproving glare of one Leo Tolstoy, looking on from a poster on her wall. Virginia Woolf, sharing the wall space, simply looks away. Elizabeth loans her books to friends, then collects those overdue on midnight raids. (Which I have never done, but ask my students, and they wouldn't put it past me.) While others go on dates, Elizabeth finds reading until the wee hours a more satisfying use of her time. She didn't spend much on snacks or clothing or other trivialities. Just books. As Elizabeth grows older, watch the pictures of the interior of her house. The piles grow. There are books in corners, on desktops, in chairs, and in the hallway. Larger ones make great end tables. Eventually Elizabeth Brown comes to a grim realization. She simply cannot have one more book. Not one. So what's a book lover to do when said book lover is no longer able acquire more books? Only a true book lover, fed for years by the creative ideas of the greatest authors, could come up with a solution that not only solves her problem, but allows countless others to share in the truly great treasure she has amassed over the years...and, of course, allows her to happily continue reading page after page after page. 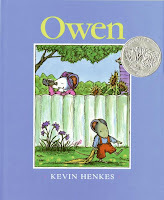 Owen by Kevin Henkes is for everyone who has their own Fuzzy. Owen's is a yellow blanket that, despite becoming not-so-Fuzzy over time, still remains his Fuzzy. A person's Fuzzy can take many forms, although soft and ideal for nighttime snuggling seems the status quo. Mine was Oscar the Grouch. Oscar got his tonsils out the same time I did and needed to have his pupils repainted after the originals wore off. Owen had Fuzzy. Fuzzy's been on many travels. Inside, outside, upstairs, downstairs. Kitchen, backyard, bathroom, bathtub. Fuzzy enjoys the same drinks (orange juice, grape juice, and chocolate milk) and snacks (ice cream, peanut butter, and applesauce cake) as Owen and has the stains to prove it. Fuzzy goes where Owen goes. Barber, dentist...school? Owen is getting older, and school is coming. Blankets are not allowed at school. Mrs. Tweezers, the over-the-fence backyard neighbor, has all sorts of suggestions. The Blanket Fairy. The vinegar trick. Saying no. Of course, anyone who's had their own version of Fuzzy knows tricks do not work. Solutions work. And Owen's mom comes up with the Fuzziest of solutions. Owen keeps Fuzzy, Fuzzy accompanies Owen to school, and Mrs. Tweezers doesn't have even one critical word about it. There are a number of things in life that are difficult. Earning straight A's. Learning an instrument. Being nice to your little brother. Staying positive when circumtances seem negative. Batting in the bottom of the ninth with two outs, two on, down by one. And apologizing. Of course, if a person does get up the courage to apologize, then comes an equally difficult task. Forgiving. 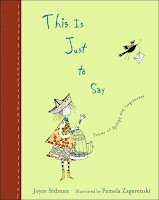 Joyce Sidman has perfectly captured the emotions involved in This Is Just to Say: Poems of Apology and Forgiveness. As Anthony K. says in the introduction, the book is a compilation of letters/poems of apology from each student and the responses received. The first half of the book includes the apologies, and the second half contains the corresponding responses. Some apologies are for seemingly small infractions: stolen deserts, over-competetiveness in gym class, or rubbing a statue's nose. Some reveal emotions much deeper: the loss of a pet, the desire to live up to a parent's standard, and a child apologizing to her father, believing he left because of her imperfections. Sometimes the apologies are funny ("Sorry, Ruebs, for belting you as hard as I could in dodge ball. I'd like to say I wouldn't do it again but I'd be lying."). The apologies are heart-wrenching ("I'm sorry, Daddy. Next time I'll be perfect."). Sometimes the apologies don't quite come out as apologies ("P.S. I notice you're not wearing that dress so much anymore. Green is not good on you, anyway. I like the new one, with the blue in it, which makes you look thinner."). As hard as it is for the students to apologize, the responses show an equal amount of difficulty. A father spends thirty lines telling his son how proud he is of him, how he barely made it through school yet his son is one of the smart kids, how he barely tried academically yet his son accomplishes so much, and the last two lines say, "forget about the window it's ancient history." The whole class forgives an anonymous student who killed the class pet. And to the young lady who thinks her father's leaving was her fault? "You are perfect. So perfect. It's me who's not. None of the stupid things I have ever done are even close to being your fault." Another interesting touch, and a realistic one, is that some people can't or don't respond. Others respond in their stead. Mr. Johnson, the custodian, offers words of comfort to Tenzin after Tenzin made the choice to put his dog to sleep. Jewel wrote a poem that included words from her father's letter. DaRon wrote in place of the Florence P. Scribner statue, namesake of the school. Tenzin wrote "for Anthony's mother, who said he was being ridiculous." I don't think This Is Just to Say would be a hugely popular book for independent reading, but possibilities abound for classroom use. Most simply teachers can use it to discuss the importance of apologies and forgiveness, and of course as part of a poetry unit, but each poem could serve as a springboard to discussions of the topics they address. Me? I think I'll include This Is Just to Say at the start of next school. And maybe I'll apologize to my previous classes for not stressing the importance of "I'm sorry," and "I forgive you," as much as I could have. I love kids like Rabbit. It's silent reading time in the classroom. These students get so absorbed in their book that they attempt to get up from their desk, traverse the classroom to the kleenex box, blow their nose one handed while crossing the room to the trash can (ignoring the one next to the kleenex box, incidentally), return to their desk, and attempt to place their bottom squarely upon the seat - and do it all without removing their eyes from their book or their book from in front of their face! Ever see a kid walk into a wall? Trip on a classmate? Completely miss the trash with the used kleenex and not know she missed? Stop mid-stride and look up with an expression that says, "Why am I at the teacher's desk?" That's nothing compared to Rabbit. Well, as you can imagine, the next word brought Rabbit out of his book induced hypnosis. Unfortunately he didn't realize, totally engrossed in his book as he was, that as he learned about wolves, real wolves seemed to come to life right off the pages of his book! And that was the last book Rabbit ever enjoyed. But fear not, ye weak of heart! Lovers of rabbits and all things fuzzy, read on! 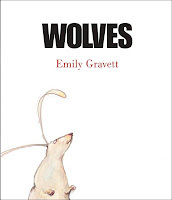 Emily Grrrabbit offers an alternate ending featuring vegetarians, jam sandwiches, best friends, and happily ever after. Either way let this be a lesson to all read-walkers everywhere. Use a bookmark. Watch where you're going. Pay attention to your surroundings. Use two hands to blow your nose. That's one great thing about books. They'll still be there after you walk home from the library or when you return to your desk. Mark your page, safely accomplish whatever task interrupted your reading, and live to read another day. Otto likes Orange. It's bold and strong and without it the world would be boring. So sayeth Otto the cat. As he's celebrating all things orange by singing his orange song, complete with some kickin' dance moves, the doorbell rings. He receives a package. An orange package containing an orange lamp. It's a gift from Aunt Sally Lee. At Aunt Sally Lee's suggestion, Otto gives the lamp a good dusting off, releasing...do I really need to tell you? He rubbed the lamp! Otto only gets one wish from this genie, and having been in the middle of an orange celebration, Otto's mind is thinking all orange, all the time. So he wishes everything was orange. Everything! How cool is this? It's great, until he starts noticing some problems. Like food. And traffic lights. And finding his house on a block of orange houses. Heck, he can't even get the blues anymore! But one wish is just that. One wish. Desperate to right his wrongs, he calls Aunt Sally Lee who quickly comes over. They creatively come up with a solution involving a nickel, some pizza, and some carefully chosen words. Otto's Orange Day is a great book for emerging readers. This Toon-Book has a simple story, engaging pictures (personally, I like Otto's dancing ability), and plenty of laughs for the K-2 crowd. Here's hoping Frank Cammuso and Jay Lynch bring us more of Otto's comic book adventures. Stealing the Famed Swan Boats: Uh, apparently not so good. Enid hates her name, and face it, you don't blame her. Especially if you were fourteen. Enid. Putrid, sordid, horrid, acrid, viscid, squalid, and worst of all, fetid. Enid. She lives two blocks west of the Public Garden on Marlborough Street with her parents and Mrs. Kolodny, the housekeeper who gives her more attention than both parents combined. One summer morning, out of the blue, Enid gets a phone call asking her to babysit afternoons for a 4-year-old. Joshua Warwick Cameron IV. With a name like that it only fits he'd get babysitter named Enid. Joshua lives on West Cedar Street, a couple blocks north of the Public Garden. Each afternoon, while Joshua's mother has her harpsichord lesson or tea with friends or plays tennis, Enid and Joshua go to the Public Garden. Except they don't really go. Cynthia and Tom Terrific go. That's who Enid and Joshua become when they cross Chestnut Street. Afternoons are spent breaking the rules Ms. Cameron has put into place. They pet dogs, eat popsicles, pick up worms and caterpillars, and talk to strangers. Without that last one, they'd have never met Hawk the saxophone player or a bag lady who knows a great place to pee at the Ritz-Carlton. Of course they'd have never organized a bag lady protest of the popsicle cart guy or the great Swan Boat heist of '83 either. If you babysat a boy who has never eaten pizza or popsicles, what would you do? What if he never got candy or had never taken a bubble bath? What if he'd never ridden the Swan Boats? Her plan doesn't go as planned. No matter how cute a 4-year-old is, when he's heir to the Cameron Fortune, "borrowing" him to ride the Swan Boats in the middle of the night suddenly sounds a lot like kidnapping. And kidnapping brings police and TV cameras and bright lights and lawyers and negotiating and being in your bedroom for a week. Or more. After all is said and done, Joshua survives the ordeal unscathed (actually, he's better off for it), and Enid successfully helps numerous people flourish and bloom like newly trimmed flowers once neglected. All with popsicles and Swan Boats. Stealing the Famed Swan Boats: Still, probably, not so good, but in this story, it's just what these friends need. So. Hacking Harvard. And everyone has a good reason. 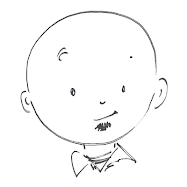 Eric: His father, a Harvard economics professor, feels engineering is nothing but playtoys. Child prodigies like Eric, kids who doodle supply and demand curves in their coloring books in the back of lecture halls, should – must – pursue a real education. Max: His father will fund Harvard, but nothing else. Harvard. Night classes at BU? Are you kidding? Work for a startup computer firm? What about the five Harvard diplomas already displayed on the family’s wall? What will fill Max’s spot? Schwartz: He’s already in Harvard. On the inside. Sixteen years old. Logical thinker, mathematics genius. His reason? He’s with Max and Eric. They hack together. Clay: Slacker. Smoker. Not too high on education. His reason? Six hundred bucks. Harvard is “the man.” Proverbially so. As in the one to whom you “stick it.” The hack is to get someone (Clay Porter) admitted to the freshman class. He doesn’t deserve it. Not even close. Clay Porter at Harvard? It’s the ultimate hack, and since Max has made a bet with the Bongo Bums, it also has the potential to be financially fulfilling. So the plan starts. Hidden cameras, spying missions, and dossiers of admission facts categorized by various statistical breakdowns. Acing the SAT, the application, and the interview. Creating an entirely new persona for Clay that the Harvard admission office will be unable to reject. The plan is perfect. But no plan ever goes off without a hitch. A romance featuring Lex, who’s actually the story’s narrator, the acquisition of funds from an untrusted fifth partner, sabotage attempts from the Bums, and even a double cross or two. All force the perfect plan to become Plan B, Plan C, Plan C1, Plan C1.1, Plan D beta…you get the picture. Much of the excitement comes when something doesn’t go according to the plan and Eric, Max, and Schwarz – and even Clay – must improvise. Hacking Harvard, written by Harvard grad Robin Wasserman, is getting my highest recommendation. Having been “on the inside,” she offers insight into Harvard and the Harvard mentality that add greatly to the story’s realism. I would keep this young adult book to the young adults, not just because of the language and some situations, but readers below high school won’t appreciate the beliefs and attitudes surrounding college admission. Most will lack the prior knowledge necessary to truly appreciate it. Below you can see the statue of John Harvard, Memorial Hall, and Memorial Church, all on the Harvard campus. Isn't this just the way it goes? The school year ends, summer vacation begins, and suddenly I have no time to update the website. Does that even make sense? Well, it is more detailed than that. My real excuse includes a combination of family vacation, hotel Internet access, computer woes, the Boston Celtics, Fenway Park, and a frustrating search for Taking Care of Terrific by Lois Lowry. Add it all together and...no updates. 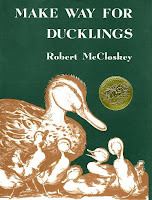 Make Way for Ducklings - A classic picture book, winner of the 1942 Caldecott Medal, featuring the Charles River and the Boston Public Garden. Taking Care of Terrific - Sometimes lost in the list of Lois Lowry's award winning literature are her other books. (No, not all of her books have won a Newbery.) This one is from 1983 and is set in Boston Public Garden and the surrounding neighborhoods. Hacking Harvard - I hadn't heard of this book, set in Cambridge, MA, until I stumbled upon it while in Cambridge, MA. So - and how could I have done otherwise? - I bought a Harvard book at a Harvard bookstore. Do you have any suggestions? What other books are set in Boston that I could have or should have included? I'd love to hear from you. Send me an email or leave a comment. It's sometimes easy to get bogged down with the critical analysis of literature (or something to that effect), and miss that fact that a book is a gripping, engaging, cheer-for-the-kid-over-the-grown-ups story, despite a lack of praise for its literary worthiness. And really, what are kids looking for anyway? Ever heard a fourth grade boy say, "I really appreciate the way the author developed..." Or, "I felt the juxtaposition of the setting and the..." Blah, blah, blah... You get the picture. Troy and his mom live together in a simple home around the corner from a gated community in Atlanta where a number of Atlanta Falcons live, including linebacker Seth Halloway. Troy's mom, after earning her master's degree in night school, gets a job working in public relations for the Falcons. She gets football fanatic Troy on the sidelines for the opening game against the Cowboys where he promptly gets his mom fired. It's an honest mistake! Troy knows what the other team is going to do. By watching the patterns and formations and tendencies he knows what teams are going to do. He can call plays before they happen. So he tries to tell the players and coaches, crosses security lines, and gets dragged out by security. Twice. And gets his mom fired. This book is football heavy, with real players mixed in with realistic characters, and play calling that's slightly simplified for younger readers. Troy calls Red Right, Thirty-one Dive Play Pass, Zebra Post, on one for his football team. Detailed, but not overly so. Real players are mentioned too - Terrell Owens, Drew Bledsoe, Michael Vick, Patrick Kerney, Randy Moss, and others - but while this adds to the realism, it could also detract for a kid who's a big football fan. Bledsoe is retired, Kearney is a Seahawk, and Vick is in prison. In the book Randy Moss plays for the Raiders. After Moss's season with the Patriots, does anyone even remember he played for the Raiders? Player movement in the NFL has quickly made this 2007 book outdated - at least the NFL references. And the book's only a year old! But the book isn't dependant on the NFL. The story of an underdog kid with an amazing talent, a football player grasping at a last chance for a championship, a family dealing with an absent father, and a glimpse inside the life of an NFL team is more than enough to entertain readers. In the second adventure of the Mysterious Benedict Society, Reynie, Sticky, Kate, and Constance find themselves world travelers. They also just plain find themselves. In their original adventure we learned of their individual talents. Now that they’ve transformed from talented individuals to cohesive team, the challenge comes in staying cohesive, in working together, in trusting one another to do what’s best for the group. Now one year after the conclusion the first book, Reynie has been adopted by Miss Perumal, Kate is reunited with her father, Sticky is back with his parents, and Constance has been adopted by Mr. Benedict. Reynie and Sticky, along with their families, are traveling to Kate and Milligan’s farm, after which they all head to Mr. Benedict’s house for a reunion. Mr. Benedict, after planning a world wide scavenger hunt for the four children, has been abducted along with Number Two by the nefarious Mr. Curtain. Having already left his clues, the children follow Mr. Benedict’s trail – not to discover the prize at the end, but to find, and possibly save the lives of, their friends. Mr. Curtain and Mr. Benedict have discovered an old family secret. Their scientist parents were researching the properties of duskwort. This plant’s amazing chemical makeup, while possibly able to aid people around the world, could also be an aid in conquering the world. Guess what Mr. Curtain wants? Guess what Mr. Benedict seeks to prevent? Mr. Benedict’s clues lead the Society to Europe, aided by new acquaintances, including and exuberant young man named Cannonball, and hotly pursued by Mr. Curtain’s henchmen, the briefcase carrying, suit wearing, kill-you-as-soon-as-look-at-you Ten Men. Mr. Benedict’s clues play to the children’s strengths. Reynie’s deductive skills are keen as ever, but he doubts the goodness in the world, after witnessing so much badness. Knowledge still sticks to Sticky, but he’s challenged by pride and finding ways to use his skills without showing off. Kate’s quick thinking and gadget using (aided by a newly improved bucket) is tested by the desire for revenge against the Ten Men for all they’ve done to her father, a desire Milligan himself discourages, showing her the distinct difference between good and evil. Constance still does what she wants and says what she thinks, but struggles to understand her continually developing skills and her growing love of Mr. Benedict. Once again there are puzzles and hints and clues, plenty of smarts and a good amount of out-smarting. Weighing in over 400 pages, the novel, much like the first one, slows down at times, but overall moves much quicker than the first. After meeting The Mysterious Benedict Society, readers will have no problem moving on to The Mysterious Benedict Society and the Perilous Journey. Of course, they’ll be eagerly awaiting the next installment as well. James and Eamon are heading to Nature Camp. Woo-Hoo!!! Nature Camp!!! And they get to stay with Bill and Pam, Eamon's grandparents, who live on the beach. Except the story never makes it to Nature Camp. We see the boys riding in Bill's jeep on the way to camp. We see them returning from camp in Bill's backseat with pith helmets, binoculars, and pine cone pets. But readers never see Nature Camp. How can this be the best week ever? There's evidence that Jamon (as Bill calls James and Eamon since they do everything together) has been to Nature Camp. There's feather necklaces, birdhouses, bird masks, and explorer's flags. And the boys complain. "I think it should be called Sit-Around Camp," says James. "Yeah, or Sweat-a-Lot Camp," says Eamon. But there's more than evidence. There's actual, photographic proof of their week at Nature Camp. Readers will just have to look carefully for it. If you just read the text, you get one story. If you just look at the pictures and speech bubbles, you get another. When you put them together you get "He was very sad when his mother drove away" next to a picture of James, smiling broadly, waving, and yelling, "BYE!" Sometimes the text alone seems downright educational. "James and Eamon learned a lot of new vocabulary words while Bill drove." Nature words? Transportation terms? Next to the picture of Bill's jeep and the driver's side speech bubble that reads, "@#%&!" you understand the full meaning. 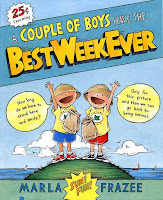 A Couple of Boys [certainly do] Have the Best Week Ever. Not only at camp, but also with Eamon's grandparents. From the sound of Bill and Pam's snores on Friday evening and the hugs all around on Saturday morning, it's pretty evident they had a great week too. And what do you have to lose? The book costs a quarter! Just see the cover. (In case you can't read the small print, it reads, "you wish." So how do wolves learn all that stuff about being big and bad? What about the huffing and puffing and dressing in grandmother’s clothes? 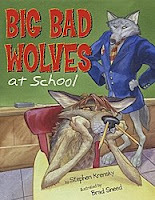 Why, they go to the toughest school around, the Big Bad Wolf Academy. Rufus needs to learn a little about being big and bad, or so his parents think. Sure, he can turn over rocks and roll in the grass, and he’s got howling at the moon down pat. But that’s not enough to survive in the world, or so his parents think as they watch him skip rope with a raccoon, an opossum, and two chipmunks. Off to school! The students learn costumes and foreign languages (“Baaaaaa!”) and how to properly wear sheep’s clothing. But not Rufus. Sitting in class is for daydreaming and letting pencils dangle out your nose. There’s better things to do when studying should be done! But then the hunters come. Costumes? Huffing and puffing? All that education is great, but sometimes you need the lessons learned from life, learned in the forest, that practical knowledge that sometimes gets pushed out by book knowledge. Rufus has plenty of that! Can hunters match up to a slacker wolf student? Can a slacker wolf student match up with a pack of hunters? Maybe Rufus, the wolf who couldn’t be taught, instead has something to teach. Otters have moved in. Next door. Right next door. Like…neighbors! Otters!!! What’s a poor rabbit to do? All Mr. Rabbit wants is to doo-dee-doo through the forest on occasion and not have to deal with neighbors like Mrs. Grrrrrrr, his former neighbor (who, according to a helpful little bee, was voted “Meanest Neighbor” six years running). Be friendly. Be polite. Say “Thank you,” and “Excuse me.” Be honest. Otters should cooperate and play fair. Sometimes otters will need to apologize, and sometimes they will need to forgive. As Mr. Rabbit explains how otters should act, he imagines the otters in numerous situations showing their otter-ly wonderful behavior. The illustrations are hilarious. I didn’t know otters – at least literary otters – wear top hats, spectacles, and funky polka-dotted swim trunks. There’s even language lessons (how to say “Please,” “Thank you,” and “Excuse me,” in five different languages). Kids will have heard all the rules before, but they will enjoy hearing them again as Mr. Rabbit explains how he expects his new neighbors to act. 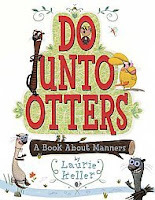 And of course, how he is expected to act toward others…um, otters.